The group of protestors urging for Madius to resign from the State Cabinet and vacate his Tuaran MP seat. KOTA KINABALU: A group of 150 voters from Tuaran are calling for Deputy Chief Minister Datuk Seri Panglima Wilfred Madius Tangau to resign as the Minister of Trade and Industries and vacate his Tuaran Member of Parliament (MP) seat. Adizal Aldain, who spoke on behalf of the Tuaran voters, said Madius had betrayed their votes and trust. The voters held a separate protest at the same time with the Black Sunday 10 rally at Lintasan Deasoka yesterday. 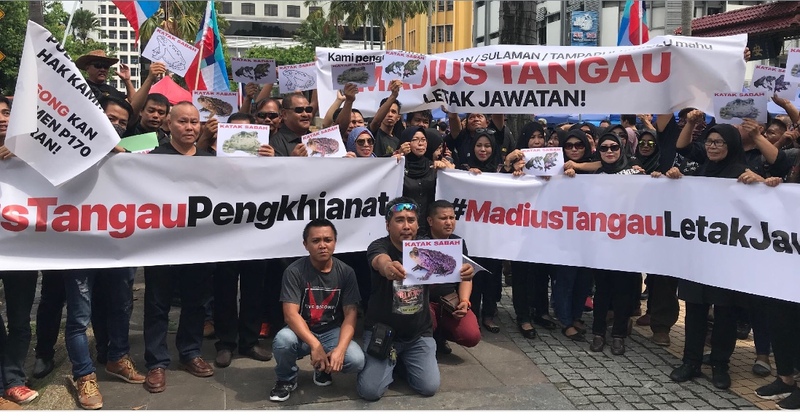 The protestors were seen holding banners calling for Madius’ resignation as well as pictures of frogs labelled ‘Katak Sabah’. “Today, we come with about 150 people representing the voters in Tuaran to render our support to Black Sunday. “At the same time, we want to voice out our dissatisfaction of Madius’ action. “To us as Tuaran voters, Madius has betrayed our votes and trust. “So we are urging Madius to resign (from the state cabinet) and vacate his Tuaran parliamentary seat,” Afizal said to the media. Madius, who is the acting president of United Pasokmomogun Kadazandusun Murut Organisation (Upko), won the Tuaran parliamentary seat under the Barisan Nasional (BN) ticket in the 14th General Election (GE14) on May 9 this year. Parti Warisan Sabah (Warisan), Democratic Action Party (DAP) and Parti Keadilan Sabah (PKR) tied with Sabah BN at 29 seats each following the election. Tan Sri Musa Aman, who was then the chairman of Sabah BN, was able to form the state government upon gaining a simple majority of 31 seats following STAR’s decision to form a coalition government with BN. However, Warisan president Datuk Seri Panglima Shafie Apdal was sworn in by the Head of State Tun Juhar Mahiruddin on May 12, after four Umno and two Upko assemblymen crossed over to the Warisan-Pakatan Harapan fold. Madius has announced on May 10 to leave BN to form the state government with Warisan and PH. He was later nominated into the State Assembly and appointed as Deputy Chief Minister and Minister of Trade and Industries. Also present was former Minister of Community Development and Consumer Affairs, Datuk Jainab Ahmad Ayid.